I woke up this morning to fat snowflakes in the air and a coating of wet snow on surfaces and plants. It wasn’t a surprise. This snow was forecast, brought to us by the outer fringes of a huge subtropical storm hundreds of miles out to sea. It was also not a surprise because April snow is normal here. There have probably been Aprils in which we didn’t get any snow, but I can’t remember one. Last year, I noted our last snowfall of more than an inch on April 6. Two years ago, we woke up to more than a foot of new snow on April 1. But, unlike the snow that falls in December, January and February, which typically remains on the ground until spring, April snow is evanescent. The sun is strong at this time of year, and daytime temperatures typically get up above freezing. This snow was only about 1 degree Fahrenheit away from being rain, and it had already begun to melt by mid-morning. By noon, the sun was out, the temperature was in the mid-forties, and all traces of the morning’s snow had disappeared. 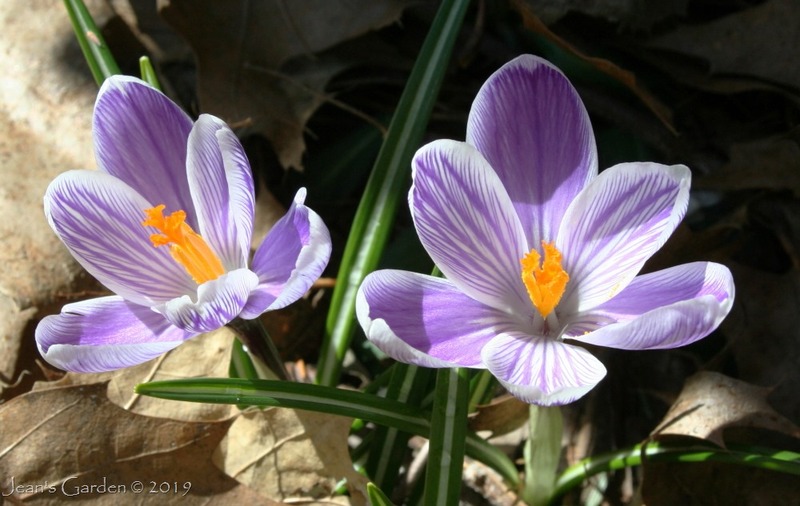 By the time I went out for a walk in mid-afternoon, the temperature was in the fifties, bird song filled the air, the just-returned robins were flitting around looking for nesting sites, and the crocuses blooming along the foundation of my house had their open faces turned up to the sun. That sounds like the best kind of snow. The crocus are beautiful. Kris, I love ‘Pickwick’ and especially the fact that it begins to bloom before the end of March in this location. Mostly I welcome snow in the winter; it insulates my plants and protects them from extreme cold and winter freeze and thaw cycles. It is in winters without reliable snow cover that plant losses are high. That being said, by this point, I am more than ready to be done with snow (especially this year when the first snows fell in October). Seven months out of twelve is a lot of the year to have snow! I woke this morning to yet another April snowfall. The sun is shining so I hope the snow will melt during the day but I’m not confident. This feels like a longer winter than normal — but maybe my eagerness to get out in the garden is the reason why. Pat, I wonder if your snow this morning was from that same big Atlantic storm that brought us snow yesterday. Last year at this time, we were having exceptionally cold temperatures and I was wondering if spring would ever come. If, like us, you got your first snow in mid-October, it’s not just your imagination that this has been a longer-than-normal winter. Enough, already! You are SO right. enough! What a beautiful post, Jean! I, like you, can’t remember an April in Maine without a snowstorm (but accept that probably have been some). I like April to hold it to just one, though. Sarah, During my first year in Maine, we had a big snow storm (almost 2 feet?) in late April, during the break between Winter Term and Short Term at Bates. Jan Phillips called me in a snit from Providence because they had 22″ and she had left her snow boots in Maine when she visited me in March. Anne Williams, on her way to visit family in Virginia, was forced to get off the highway and get a hotel room in Massachusetts, where she encountered other Bates faculty taking refuge at the same hotel. Like you, I’m hoping we don’t get any more measurable snow this year. As much as I long to no longer see snow, there is something very beautiful about the first snowfall of the season — when it first clings to barren branches — and the last snowfall of the season — when spring flowers can be framed against a white background. Lovely post. Purple striped Crocus is a delight! Diana, Crocus vernalis ‘Pickwick’ is a favorite of mine, and it’s a special delight after the color-deprived season that is winter. No month says transition to me more than April in Maine Jean. Fall transition can be subtle, but Spring is like a battle of two seasons. That’s especially true this year Gary — snow in the mornings, spring in the afternoons! More snow forecast for tonight; this may be enough to need plowing. Sigh. I know it’s just a little setback, but I’m so ready to be done with winter. Someday, I must see this ‘snow’ (in abundance like it is there) just to see what it is like. I just want to see it briefly. I do not think I want to live with it. The little bit I saw in Oklahoma was fun at first, but after a few days, I could understand why no one likes it. On the contrary. I believe the majority of us in Maine love snow (what is winter in Maine without snow?). It’s just when we get to April we say, enough is enough. Well, actually, as a Californian, I dislike some of the weather that people used to come here for. It is nice most of the time, but I will never understand why anyone would want to summer in Palm Springs, where it is 110 degrees for days at a time. There is nothing pleasant about that. Gary is right; most Mainers love snow. You may be wondering what’s to love about it. First, it is beautiful. I love it when we get our first snow of the season overnight, followed by sun in the morning. As soon as I open my eyes, I know it has snowed just by the quality of that soft, suffused light filling my bedroom. When I get up on snowy mornings, the big windows in my bedroom leave me feeling as though I’m in a snow globe. On February 5 in 1976, it snowed in the Santa Clara Valley. It was about half an inch deep! It was terrifying! When we kids got up, the sunlight was a bit brighter than it normally was. When we looked outside to see everything was all white, we really freaked out and ran screaming for our parents, who tried to explain that it was harmless. Eventually, we investigated, and found that it was actually rather interesting and fun; but we had to go to school. In melted during the day, and we never saw it again on the Valley floor. It was only visible on the distant mountain tops. It would be fun to see it again, although NOT here. It does some serious damage to the redwood trees! Once I see it though, I would want to come home. I would not want to deal with it for months. What a story Tony! I can’t even imagine what that must have been like for you. By the way, I’ve traveled through the Redwood forest once in my life. I am prior Air Force and have been all over the world, but I can tell you that it is one of the most beautiful locations I’ve ever been. Even as a near native, I never get tired of it. I have lived and worked in the redwoods for many years, but their range ends very abruptly where the Santa Cruz Mountains meet the alluvial floor of the Santa Clara Valley. In my former neighborhood, I could see the redwood on the south edge of town, but lived where only oak woodland had been. Hello Jean, I can’t believe you’re still dealing with snow while I’m complaining about having to take my coat on and off as the sun goes in and out of cloud, which might or might not rain. It’s four-seasons-in-a-day here at the moment, I hope your weather settles firmly on “warm sun” soon. Sunil, Spring has finally arrived here. 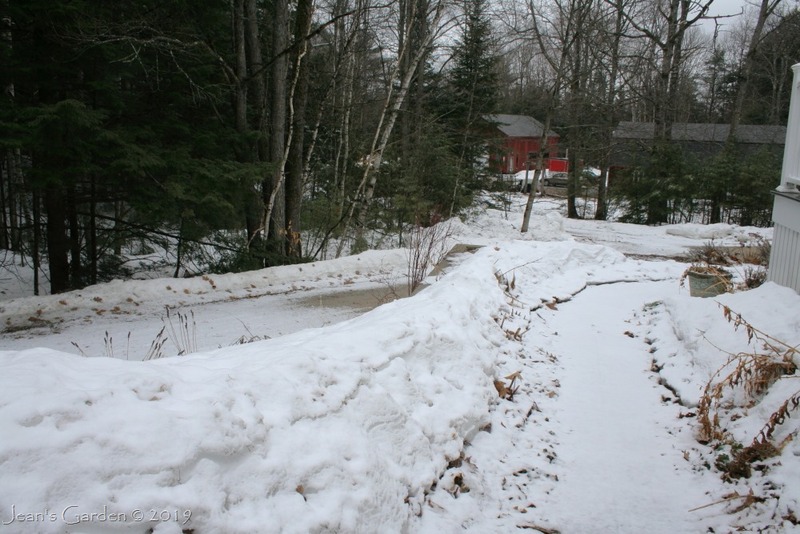 Over the weekend, temperatures got up above 60F (16C) for the first time in six months, and the snow is melting fast. I have now begun spring clean-up in the garden, starting with the flower beds that are already snow-free.